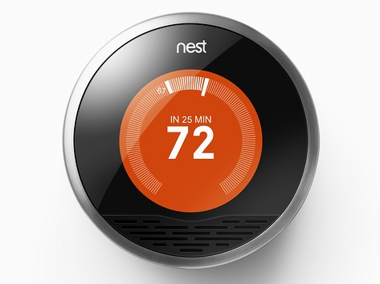 Thermostats are not the most popular topic for high-tech and Internet blogs – but Nest hit a nerve. Nest offers a thermostat for the home. Probably because it’s a San Francisco start-up, possibly because it has some leadership that once worked at Apple, or possibly because it has a nifty display – it became an instant darling of the high-tech blogosphere. It became the most boring got-to-have item in consumer tech. I love high tech gadgets, including thermostats, and have more than my share in my current home – more on that below. I found the Nest thermostat interesting, but hardly worth blogging about (initially). It took several characteristics of high-end thermostats and made it round and used a clever digital round display. I don’t believe it has any unique features compared to whats available on the market. This post lists several alternatives available. I’ve heard people excitedly talk about the Nest thermostat. So what technology is Honeywell talking about specifically? Oh, only the some key features of the Nest device including the outer controlling ring dial, the interview questions to start programming the thermostat, tech around being able to control the thermostat via the Internet, the Nest “Time to Temperature” function, and the way that the Nest thermostat diverts small amounts of power from the house’s electrical load to power itself. But wait, those are some of the same features I”ve enjoyed for years. Looks like the Patent infringement nonsense stifling innovation in smartphones could spread to my thermostat. I also think it is interesting that Honeywell is naming Best Buy as a defendant. I do agree with Honeywell that Best Buy is guilty of promoting Nest as Innovative, but that’s what sales is all about. Every retailer claims to be a retailer of innovative products. The Uniform Commercial Code protects resellers and retailers from liability against such vendor intellectual property claims. U.S. Patent No. 7,634,504 – this patent was filed in 2006 (issued 2009) and covers displaying grammatically complete sentences while programming a thermostat. U.S. Patent No. 7,142,948 – this patent was filed in 2004 (issued 2006) and covers a thermostat figuring out and displaying how long it will take to get to a specific setting, like temperature. The Nest definitely has this feature; it’s a main selling point of the device. U.S. Patent No. 7,584,899 – this patent was filed in 2006 (issued 2009) and covers a thermostat with a face movable (e.g., rotated or turned) around a central display. The display shows a change in a setting as the face is moved. U.S. Patent No. 7,159,789 – this patent was filed in 2004 (issued 2007) and covers a thermostat having a rotating selector, a potentiometer and a non-rotating element (like a display) on the front face. The non-rotating element is fixed to the thermostat housing with a support member offset relative to the rotating selector. U.S. Patent No. 7,476,988 – this patent was filed in 2005 (issued 2009) and covers a power stealing system that transfers power from the switch to a storage device when the switch is off, and powers the controller from a secondary power supply if the power at the storage device is insufficient. U.S. Patent No. 6,975,958 – this patent was filed in 2003 (issued 2005) and covers a method of controlling an environmental control system from a remote to adjust the settings of the system. Did Honeywell really get a patent for grammatically complete sentences on a thermostat? Would Nest be accused of infringement if they remove the period at the end making it grammatically incorrect? A rotating dial is protected? Remote control of the thermostat is patent-able? This makes no sense. I hope Nest has some deep pockets to argue the validity of these patents. Or else, a lot of good products – products that have been on the market for years – are doomed. Come to think of it, it’s odd that Honeywell is going after Nest – how many could they have sold in the past few months? The question is who is this patent really protecting? Speaking for Honeywell, Bruce Eric Anderson, the company’s director of external communications, said “We have 20,000 engineers that come here every day and it’s about protecting those individuals.” If those engineers he refers to are the ones that got a patent for grammatically correct sentences and rotating dials – they should be ashamed. In a statement to Mashable on Feb 8, Nest called the lawsuit a “patent-attack strategy to stifle competition” and said it will vigorously defend itself. If Nest is, as it claims, the victim of a lawsuit brought on solely to shut it down, it wouldn’t be the first startup in its position. “We have the resources, support and conviction to do so,” the statement reads. I am a big a fan of home automation – but it isn’t exactly intuitive or cost effective stuff. My biggest complaint about these smart thermostats is they are regularly marketed as cost saving devices. There is no doubt they have the potential to save energy – but probably most don’t. Wild swings (turning the temp down 10 degrees while the household members are away for the day) is not practical or efficient with in floor radiant heat. But even if they do save energy – they will never pay for themselves. These smart stats are too darn expensive to be justified in anyway other than emotional gratification. Connected thermostats have been around for a decade and prior to the Nest were off radar for non-geeks. The prices need to drop below $100, and Nest is in the wrong direction. Honeywell just raised prices across the entire industry. My final point – back to telecom – is I’ve been experimenting with the NEC DSX phones that integrate into the home automation. 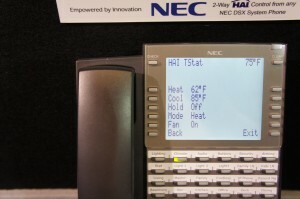 This makes the thermostat controllable from the phone-top (digital or VoIP). This is very smart – it means the device on the bed stand – you know the one with the big display and real keypad – can adjust the temp in the room (as well as a lot of other items). I wonder if this infringes on US Patent No 6,975,958. I sure hope not, because it is brilliant – more so than anything I’ve seen from Honeywell.